This entry was posted in Relationships, Trust and tagged 2 timothy, bible, building trust, challenge, character, Christ, confidence, daniel, focus, following, Holy Spirit, human, learning, moses, move, opportunity, perfect, practice, quotes, read, reflection, relationships, scripture, struggle, time, trust, victory, work by admin. Bookmark the permalink. 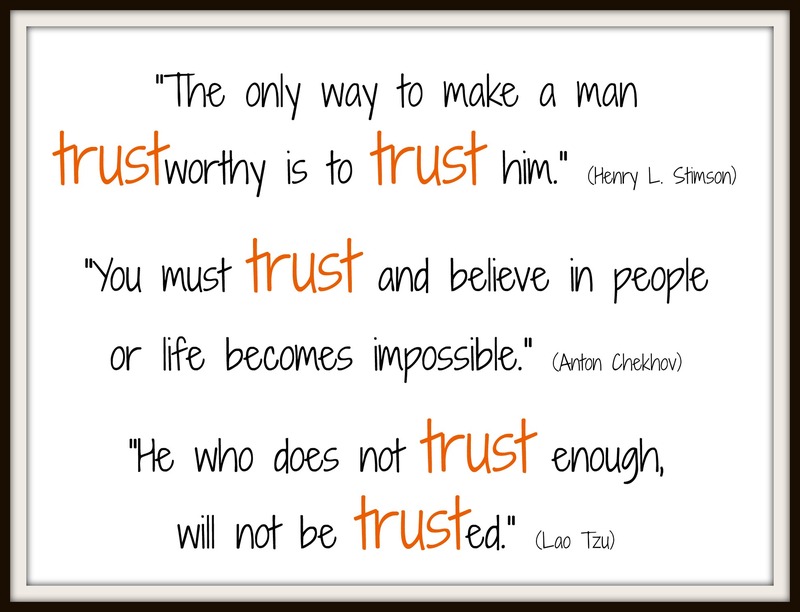 Trust motivates and it communicates love. Trust also requires us to take action and do the things that it expects of us. So trust not only requires character but it requires proper actions as well. Stephen M. R. Covey the son of Stephen Covey wrote a book called The Speed of Trust. It is an excellent book on trust. He calls trust "the one thing that changes everything". Trust & love go hand in hand, and both are choices we often have to make even when feelings/emotions tell us something different. And you're right, people do rise to our expectations. I find that I must not set expectations too high though, or they won't even try. Need to gradually raise them. Great quote by Washington, and I've seem this happen in amazing ways with my youngest son. Thanks for the book recommendation too. I'll check into it! Once trust is broken it is hard to recreate, but sometimes it has to be. A broken marriage. A wayward teen. I'm glad I have a God who has never broken His trust and loves me in spite of the fact I do. Difficult but not impossible. I've seen the work of God rebuilding trust in enough relationships to know it can be done. It's one of the most difficult choices to make, kind of like choosing to love someone even when we don't feel love toward them. Because God never breaks trust and because he loves us even though we do break trust, we can make the choice to also continue working to rebuild trust. He is in the business of the impossible! i definitely agree Kari. I have seen it happen myself. Following God's lead on this is the way to go. Great post Kari. Although I may trust again I think it's different. I think we become wiser and maybe a little more cautious. For example, if a friend betrays something told to them in confidence . . . I most likely will not confide in them in the future although we remain friends. I do agree with you, out of love we continue to do the work that rebuilds trust. Thanks, Deb. Certainly, we should become wiser in our relationships as we go through issues with broken trust. But ultimately they hopefully make us and the relationships stronger. Going through tough stuff & not giving up often has that result. I think we also need to consider both the consequences of trust and also the changes in the person who breached our trust. For an extreme example, I don't really think it would be wise to trust a sexual predator to be a kids' worker at church. I think it's one thing to establish relationship with the person again and love them. It's another thing to generally "trust" them in the sense that you believe they're honest and have integrity. But it's a different matter to trust someone in the sense of delegating or putting them in potentially risky situations. A good point, Loren. We must change our expectations of people based on the history of trust, broken or built, with them. We need wisdom in trusting others for sure.